These specially designed carts are ideal for nursing home personnel when transporting laundry to and from residentâ€™s rooms. They allow keeping residents clothing separated and ready for easy distribution. Adjustable divides and label holders are included with each basket to help prevent laundry mix-ups. In addition, the baskets slide out lock into position for easy access to the laundry or they can be removed and exchanged with a spare basket in each room. A sturdy garment rack is available for hanging clothes. The heavy duty steel construction is chrome plated for a clean, professional look. The cart rolls easily on its gray 5â€� swivel casters (2 with brakes). It can ship via UPS/FedEx for a substantial savings on freight and is easy to assemble. Fitted flame covers available in 4 attractive colors. 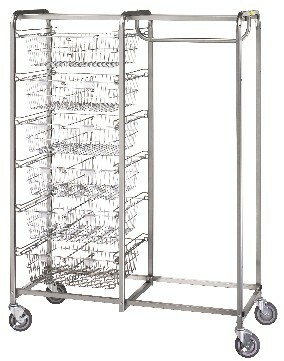 Baskets for the resident item carts are 22-1/2â€�L x 19-1/2â€�W x 7â€�H.